" People see me and think I'm weak. They want to take care of me. But I can take care of myself by myself! " 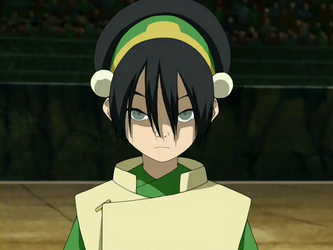 Though she was small as a child, Toph has grown into a a rather solidly-built woman of slightly over average height. Her features are mostly round, and she has a rather large head for her size. Her eyes are an extremely pale, greyish green, never looking at anything in particular. Her mouth is wide, and usually spread into a mischievous smile, though her lips are rather on the thin side. Her black hair is straight and long, though she usually keeps most of it up in a bun, save for her bangs, which are usually long and hanging in her face. Ever since Falmarsk taught her what color was, she's tried to only wear green clothing. At first that was difficult, since she didn't know what color any of her clothes were, but eventual pestering of her parents led her to have an entire wardrobe full of green, and now that's all she wears. It makes it difficult for her to wear outfits that don't match, since just about everything she owns is in the same color family. She sticks to shirts and pants, finding skirts obnoxiously restrictive, and hates wearing shoes. She prefers her toes to be free. Toph is a strong, independent, extremely sarcastic young woman. No matter what the situation, she’s determined to be able to do everything herself, whether or not it’s even remotely reasonable. Need to lift something extremely heavy? Toph will try to do it on her own. Her ego is helped along some by the fact that she’s relatively strong and muscular, and she frequently takes whatever opportunity she can to prove it. Arm wrestle a guy twice her size? Sure, why not? However, to those that she considers her friends, she’s extremely loyal, and she’d fight alongside them to the death if need be. She hates feeling constrained by rules and regulations, and will break those whenever she finds it necessary, and sometimes when she just feels like it. She’s generally fairly cheerful and light-hearted, making up nicknames and poking fun at just about everyone around her. However, she has a bit of a hair-trigger temper, though she usually calms down just as quickly as she gets angry. The quickest way to earn her ire is to imply that she can’t do something due to her blindness, aside from the obvious things that she’s physically incapable of (for example, looking at a picture). The sarcasm is strong in her, and Faranth help you if you try to get her to read or look at anything, because she just might not let you ever live it down. She has a tendency to not share her feelings, instead bottling them up inside and walling herself off when she’s unhappy; Artosk is just about the only one who can get anything coherent out of her when she’s upset. She’s especially bad about announcing any sort of romantic attraction, and on more than one occasion her failure to do so has meant she’s missed out on opportunities. She shows her affection through punches to the shoulder. They’re affectionate punches, she swears. Tao and Pailoph, being closely related to the Crom Lord Holder (he was Tao’s uncle), were expected to do at least one of two things: bear a son—just in case something went horribly wrong with the rest of the Bloodline—or bear a healthy daughter to marry off to another family for political gain. They got neither. They got Toph, and had no other children. Most of the time, they kept Toph hidden away, both ashamed of her blindness and worried that someone might take advantage of her if they let her wander around freely. Almost every minute of her day was supervised, and while she learned some things, such as the Teaching Songs, other things, such as games of tag with other children, were denied her due to a perception that they were dangerous. This very quickly led Toph to develop a rebellious streak that would only grow over time. She learned to make her way around even without sight, though the world that she knew was small, restricted primarily to her family's quarters unless she was being guided elsewhere for a particular purpose. In many ways, she was brought up to be just as a Blooded young lady should: quiet, polite, and demure, at least when her parents were looking. When they weren’t looking, she was usually attempting to figure out ways to slip away from her tutors and babysitters so that she could explore the Hold, though what she really wanted was a way to get down to the mines. Most of the time, she barely managed to make it out of her family’s dwelling quarters before being hauled back by a drudge sent to find her, but eventually she got better at escaping quickly, running headlong down hallways with one hand trailing along a wall, taking whichever twists and turns she dared so that it would take longer for her to be found. Eventually, she wandered somewhere she hadn’t been before. The air was stuffy, and smelled of sweat and dirt, and something very large was breathing in one corner of the room. She headed toward it fearlessly, and in so doing walked straight into Falmarsk. The wher, not being particularly pleased at being woken from her slumber even if she did want to know why she was there, immediately shooed the girl from her quarters, lest she wake up her handler. So of course, Toph did the only logical thing: she came back the next day. And the day after that. And the day after that. Eventually she managed to show up at a time when both Falmarsk and her handler, Falmarin, were awake, and she quickly befriended the grouchy handler and his eternally-curious wher. She learned everything she possibly could about wherhandling, though Falmarin warned her that it would be quite some time before anyone would ever consider giving her a wher; after all, she was still too young, and she was blind, and her parents were not remotely on board with the idea. In fact, they repeatedly tried to find out where there daughter had been going when she disappeared, but Falmarsk and her handler would never tell. It was Falmarsk who finally took her down to the mines, one night when only the third shift was on duty, and that was the smallest shift of all. The air was full of dust down there, and sounds echoed even more harshly than they did in the depths of the Hold. She thought it was incredible, even if Falmarin said there was nothing to see. Why would she care if there was nothing to see? However, there was one thing that Toph never considered: Falmarin and Falmarsk were her best friends, but Falmarin had been a handler for a long time. She knew what he looked like—his green had shown her a few times—but she had no frame of reference with which to understand just how old he really was. As she grew older and stronger, he grew slower and frailer, though the green kept on as strong as ever. The bonded pair knew that their time together was waning, but one night when Falmarin collapsed and never would rise again, it was the last thing Toph had expected to happen. All she knew was, Falmarsk was panicking, bugling about following him to wherever he was, so she did the first thing that came to mind: she felt along her friend’s body for his belt knife and, once she found it, cut open her own hand in order to re-bond Falmarsk. She’d just lost one friend, and she wasn’t about to lose another. Unsurprisingly, her parents’ reactions to her bonding Falmarsk, now Artosk, were fiercely negative. Ladies like her didn’t become handlers! Even if she was blind, they could marry her off to some lesser family, ensure that her future would be secure even if it wouldn’t bring them any political power. But Toph was insistent on keeping Artosk and, with a wher to lead the way, decided to do what she never thought she would: she left Crom. Unfortunately, she had no idea which way anything else was, and eventually she and Artosk figured that their best bet would be to find a caravan or someone else traveling, to drop them off at the nearest Weyr. They did, eventually, find a caravan, which was more than grateful to have the security of a wher around, a wher who could warn them of Threadfall if it came at night, and after some time came to Fort Weyr, where they have been for the past few months. Has managed to learn her way around the Weyr well enough that she doesn't really need Artosk's guidance, though she still likes the snarky green's company. Her leg and foot were badly scored when she stepped into a Thread burrow, but she'll recover. Transfers to High Reaches when her family learns of her location; she really doesn't want them bothering her. Somehow becomes Wherlingmaster. She will tell off anyone who questions her on that. 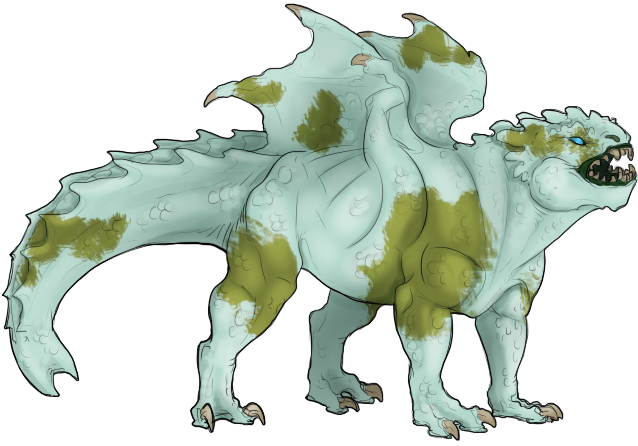 Artosk is a green of relatively slight build, with almost dainty little wings and slightly longer limbs than might be expected. However, she’s still a wher, packed with muscle and scarred from her Turns of fighting off those who would dare to threaten Crom Hold. When she lies perfectly still, Artosk almost looks like a lichen-covered stone. 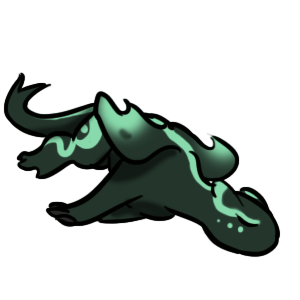 Most of her hide is a light, blueish green color that’s slightly mottled so that it’s darker in some places and lighter in others. However, her wings and hindquarters have irregular patches of a more brownish-yellowish green, and that same green also covers her right headknob and is draped down her neck from there and down her right foreleg to about the knee, only to be interrupted by the lighter color until her foot is the same, more yellowy green. Her hide often appears to be cracking, no matter how well-oiled she is, though closer inspection will show that it’s actually just the color patterns on her hide. Artosk is intensely curious about just about everything, investigating anything she comes across; she often bites objects to find out how hard they are, or licks them to see what they taste like. She's thirsty for knowledge, no matter how obscure, and has been known to tell random facts to people she meets, usually beginning her pronouncements with "you know..." She has a good memory for these facts, though her memory of events that have actually happened to her is rather less good. When not learning things or involved in some sort of required duty—for she takes assigned tasks very seriously indeed—Artosk is often digging holes. She loves mud and dirt, much like her handler, and gains a strange sort of enjoyment just from digging, much to the consternation of anyone who ever has to clean up after her (Toph, usually). She's protective of her handler, almost to a fault, though she's quick to befriend people that aren't actively trying to hurt Toph. Tosk is a big, burly blue, just as a wher should be. Gruff face, string form, big feet, all a perfectly average wher and nothing is wrong. He is a foggy blue all over, like he is made of mist and mystery... even if there's nothing really mysterious about him. 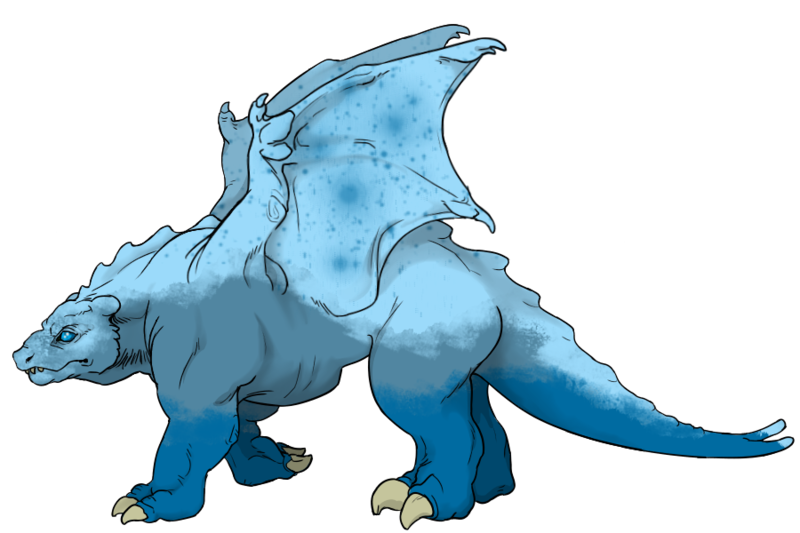 His underside and legs are a slightly richer blue, notable enough but not overpowering, as if his legs are the earth. Over the top of him, and right in his face, is a brighter, snowy-blue that looks like there's clouds gathering or that he's been frosted like a cake. His wingsails have bright, star-like spots. Tosk is loud and proud, and few things can dissuade him when he sets his mind to something. He's somewhat abrasive seeming to some, and is somewhat of a joker, often making puns or acting out antics. A little over the top, he's none the less extremely sharp witted and intelligent, and an excellent hunter. Instead of relying on prowess or mastery, he uses his instincts to lead him on the hunt, and often times the results are incredible. He's very good at coming up with ideas or thinking on the fly, with a creative streak that lends itself well to tactics and hunting alike. He's fiercely protective of his handler and companion wher, going as far as to attack others if he thinks they've been harmed or are in real danger. He's loyal and steadfast, willing to go to the ends of the earth to help out if he thinks he can really be helpful. He sometimes loses his confidence and can get sulky, but this passes as soon as he's reminded he is also important. In the end, he wants nothing more than to be friends with people and have a purpose. Voice: Tosk's voice is sometimes loud, sometimes thoughtful. It really depends on his mood and antics.